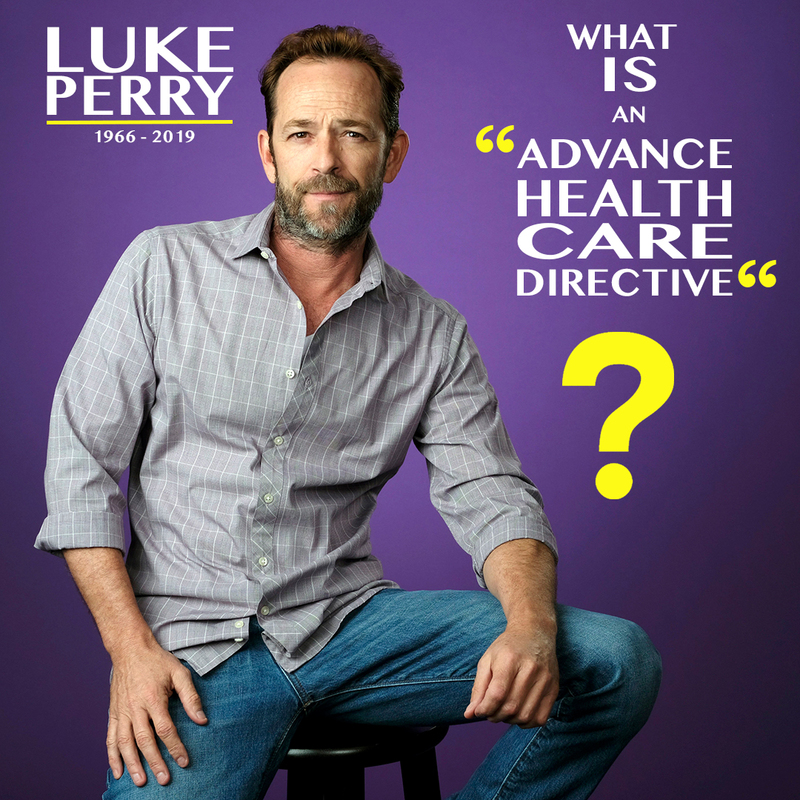 LUKE PERRY (90210) SHOWED US HOW TO DIE. Luke Perry suffered a major stroke at 52. Like many in the movie industry, he had a blended family . . . an ex- wife, two adult children from his first marriage and his fiancé with whom he had lived for 10 years. In legal parlance we call this a blended family. The good news is they were all at his bedside when the doctors stopped his life support system. They were able to hug, kiss and cry together without any argument. Why? Mr. Perry had made the decision for them with his Advanced Health Care Directive. An Advance Health Directive is a legal document that states unequivocally what you want to have happen at the end of your life and you can no longer make decisions because of illness or incapacity. Each state has certain criteria. In Florida the doctor has to state that you have no reasonable chance of regaining the ability to recognize or communicate with others or are in intense and irreversible “suffering”. Once this is the determined you can choose not to be resuscitated, not to have IV fluids or to be taken off life support if that is what is keeping you alive. Oregon, along withColorado, California, Vermont, Washington and the District of Columbia allows you to choose when to die with Death with Dignity laws or Assisted Suicide. This is most often used for terminal illnesses and, like the Advanced Health Care Directive, has specific metrics. In Oregon you have to be over 18, mentally healthy, it must be voluntary, 2 physicians have to agree that you have 6 months or less to live, you must make 3 requests, 2 oral with at least 15 days in between, and 1 written with witnesses. Then, you have to administer the lethal dose yourself. An Advanced Health Care Directive or the choice to die on your terms is a legal document and procedure with a HUGE emotional factor attached. This is a highly stressful time for any family and stress creates disagreements. An Advance Directive removes the stress, disagreements and allows a family to mourn together, not apart. In Florida we had a great example of this when Terry Schiavo collapsed in 1990 at the age of 26 and was on IV Fluids and Life Support for 15 years while her husband and parents fought how she should die through the courts. No matter what your age, think about your-end-of life now, get the planning done – let your family grieve together and remember you as you wish to be remembered.